Peter Davison and David Tennant may not really be a Doctors, but they have helped someone who is very ill. The pair, alongside companions Billie Piper and Jenna Coleman, have made charming and very kind video messages for Mark “Houndy” Gunther, a huge Doctor Who fan who is bravely battling terminal cancer. Mark, who was born in London, now lives in Walthamstow. He loves Elvis Presley (his nickname is a reference to “Hound Dog”), and is a sci-fi fan from childhood. Mark became ill in December 2015 and quickly learned that his cancer was both advanced and terminal. Mark made a very short bucket list: to meet as many of the Doctor Who actors as possible, and to walk around the Millenium Falcon. Wonderful goals indeed. Mark’s good friend, Wenna Blewett, decided to help Houndy realize these dreams. She started a Twitter campaign, #HelpHoundy, to arrange for Doctor Who actors to contact Gunther. Many of Gunther’s friends and even his local pub got on board. News of this young man’s wishes reached actress Lisa Bowerman, who’s appeared twice on Doctor Who, and is well known as Karra on “Survival,” the last of the original series. She also plays Bernice Summerfield in the Doctor Who audio plays. Bowerman passed along the request to the actors of Doctor Who and helped get two videos made and sent them along to Mark. One video shows Peter Davison, the Fifth Doctor, facing the camera, along with two familiar companions with their backs to the camera. The three were in Miami for Comic Con. 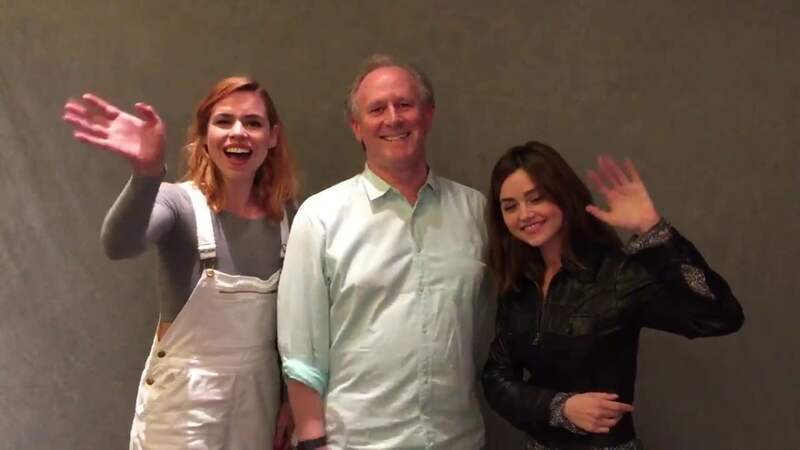 Davison sends Mark good wishes, and then both Jenna Coleman and Bille Piper turn around and do the same. Mark’s last post was of the Twelfth Doctor sitting next to Clara’s portrait, so he must have been quite pleased to get this video. In the second video, sent to Wenna Blewett, Tennant emerges from a TARDIS and ponders, “why do things get smaller as you get older?” He goes on to say, “So many people clearly love you very much and they even tell me what a great guy you are.” Tennant goes on to send Mark good wishes. The Doctor Who community has always been a supportive one, and these acts of true kindness to a fan are especially touching. How many times do we have to keep saying it (hopefully many more times): class acts, all of them. Thank you so much… David, Peter, Jenna and Billie will never know how much their messages cheered Mark up. I may have started the hashtag but it’s through mine and Mark’s friends and extended friends it has travelled social media and got noticed by the lovely Lisa… and not forgetting Georgia Tennant who encouraged her dad and husband to get on board. Thank you. We are glad to have done our bit. So pleased to see four actors coming together for Mark. Here’s to many more, I hope!